Collecting samples involves the isolation and careful gathering of specimens of interest in a given environmental study. Important environmental parameters such as pH, dissolved oxygen, electrical conductivity, and hydrological conditions aid in classifying the collection environment. Methodologies employed to measure such parameters can be as involved and diverse as the studies themselves. 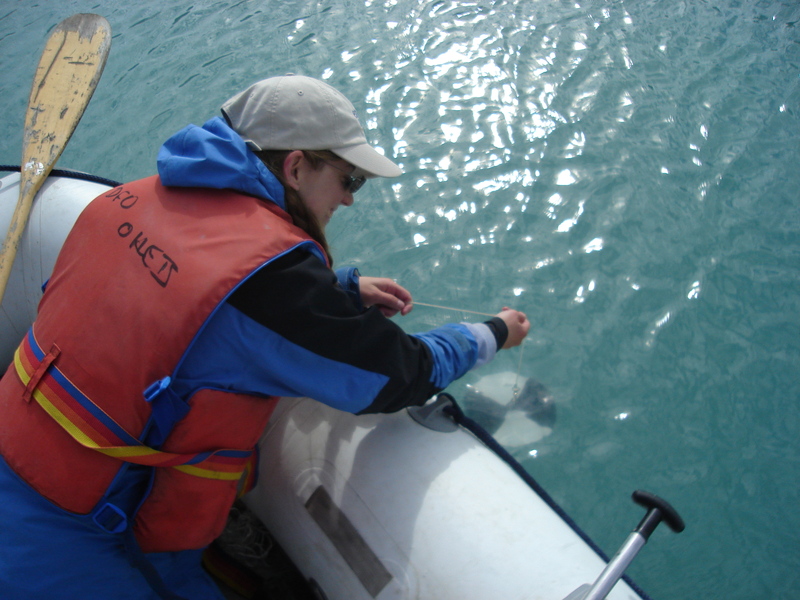 A researcher measuring turbidity in a glacial lake using a Secchi disk. The disk is lowered into the water until it can no longer be seen, and the depth of disappearance is recorded. Photo provided by Monica Bruckner. Picture provided by C. Carlson 2005. 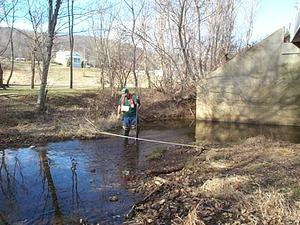 A man gages a stream by measuring water velocity (using a current meter) and water depth at several points along a cross-section of a stream channel. Image courtesy of the Loudoun County/USGS Water Resources Investigation Website.